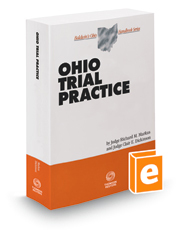 Consult Ohio Trial Practice for fast access to basic principles of Ohio trial law and their proper application, as well as a step-by-step guide for preparing and pleading cases. The text clearly and concisely discusses both procedural and substantive aspects of trial law. Analysis of recent trial caselaw, rules, and statutes keeps you updated. Proper authority is cited for every statement, including recent state and federal caselaw.